To celebrate our exhibition Re:Purpose, Ordinary Objects Made Extraordinary, presented by Mtn Dew Black Label, we’re paying homage to creatives riffing, transforming, and remixing the everyday. To see more fearless reinvention of the ordinary, click here. Right now, if you randomly ask a 23 year-old their favorite artist there’s a large chance they may babble on about the usuals—Basquiat, Banksy, Warhol or KAWS. Not Atlanta artist and innovator Markeidric. Celebrating his “Jordan Year” this past June, the classically trained painter cites Rembrandt, Leonardo da Vinci, and Edward Hopper as his biggest influences. But despite taking art classes since the age of five, mastering materials ranging from watercolors to pastels, as well as gaining a painting degree from Savannah College of Art and Design (SCAD), Markeidric still can’t resist trap music and Rihanna. Loving the two worlds of classic and, well, ratchet, so much, he decided to blend them together to create his own style of art. 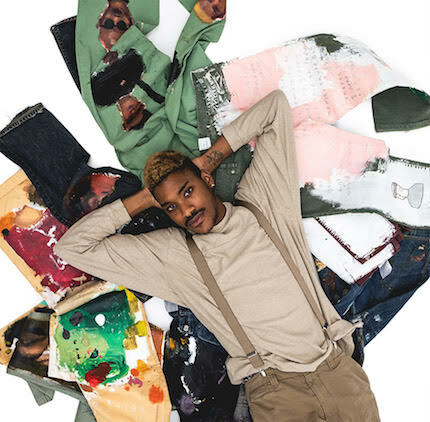 Now taking his innovation a step further by affixing his masterpieces to clothing and furniture, Markeidric is set to host his first solo show, titled 15 Years of Momentum, and change the way the world sees traditional highbrow art. Just like a true artist, Markeidric has always loved writing on things. You know, growing up, I couldn’t really write on everything because my parents were buying stuff [laughs]. When I hit college, I didn’t have money for things, so I started thrifting a lot. Then, I was able to treat clothes like art because everything was cheap. I started buying all types of different styles of clothing and then writing on them to basically turn them into art pieces. Recently, I just created a brand called Dante’s Closet. It’s pretty much a collection of the style that I’ve made over the years from thrifting a lot, and my art that I’ve been doing, together. Markeidric says his style is just another take on pop art. Pop art, like Andy Warhol and all of that stuff, stems from the idea of pop/popular culture, so I’ve been always understanding pop art to be about that. I just try to mix that with classical-style painting because those icons will never die. That’s what I’m trying to do with Rihanna. I want to make her like a Madonna figure, you know? 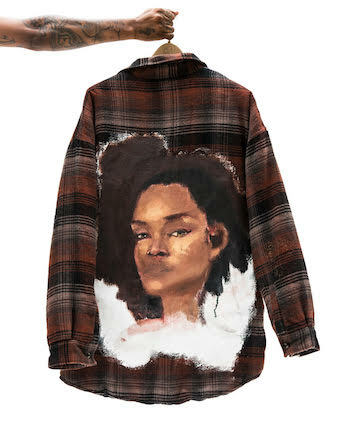 Basquiat was painting Madonna to put her in history books, so I’m trying to do the same thing with Rihanna. I like to blend [pop culture and classic art] for sure because I can use these figures in the same way that the classical painters used their figures. His ties to Rihanna also venture into the music realm, where he also designs cover art for artists like Future and producer Mike Will Made It. 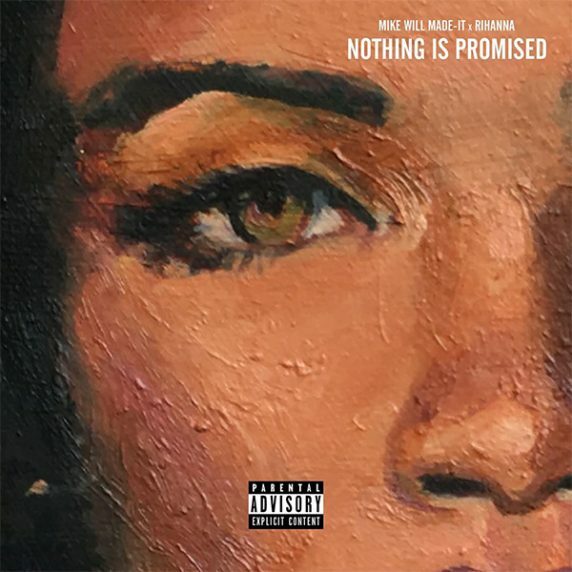 I did the “Nothing Is Promised” cover. I’m really good friends with Mike Will; that’s my guy. I’m doing his album cover right now. I’ve done cover work for Future, like sketching ideas for an album cover — I just gotta finish that. I’ve been doing a lot of stuff in the music industry. All the Young Thug and Rihanna stuff, and then Mike Will, people love that, so that’s been my focus as of late. I just like mixing the history. I don’t know too many black guys that grew up classically trained. Don’t count on him for commissions, though. It’s a difference between somebody asking me to paint them, and me painting somebody because they’re that interesting for me to paint. With painting, I’m just studying the people; I’m studying everything about the person. I listen to their music while I’m painting, so it’s pretty much people that are remarkable to me. 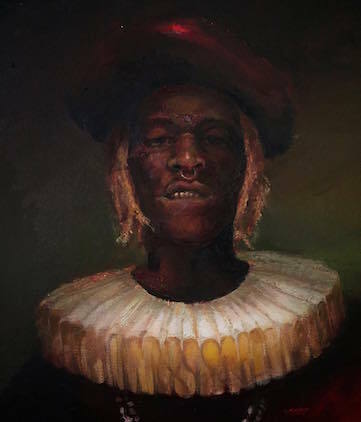 I’ve done Young Thug just because of his controversy with fashion. I like to paint something, and then say, “OK, this person would be good here.” It just makes the process way better. The fun is way more valuable than profit. Markeidric’s eye is for textures, patterns and colors. I know what the value of a surface is—whether it’s a jacket that would look good with paint on it, or if it’d look good by itself. If it’s a bag or a table or a pair of shoes, I can see the value in the pieces before I paint on it, and then I can see whether it’s worth adding paint to it or leaving it. In school, they teach you everything you paint should be as beautiful as the canvas was before you put paint on it. So if it’s beautiful naturally by itself, don’t paint it. If it’s beautiful, but would look beautiful with paint, paint it. I don’t really like new things because they have a modernistic quality to them. I can tell the difference between modern stuff and traditional stuff because of the quality. The handmade stuff is way more valuable. So when it comes to new things, I’m more likely to want to destroy it and cover it [laughs]. If you’re thinking about dropping out of school, Markeidric says don’t. My parents—no way were they with that. Education’s a thing, man. It’s kind of like knowing you have a super power. Most people don’t study art and learn art for real. They just pick a style, and they draw that style in big, cool ways. Markeidric says the hardest part about finding your voice is thinking you have to develop one. That’s deception. The real truth is you’re going to make a voice naturally, but you don’t have to do it. You have to study, and you have to get better at skill. In school, they’d tell me, “Stop thinking. Lose the idea that you have to have a style.” That’s the worst thing in the world. Think about music: That’s why music is getting so bad, because they all just have a style. They don’t build technique; they don’t build skill.We have little-to-no artist development. That limits everybody from being better. The second [thing] is trying to duplicate [someone’s] imagery instead of the sensation in the moment, the experience. You have to live the moment to make something as valuable as what you’re referencing. You can’t just think you can copy an image because it’s going to be missing all the moments that went into it.